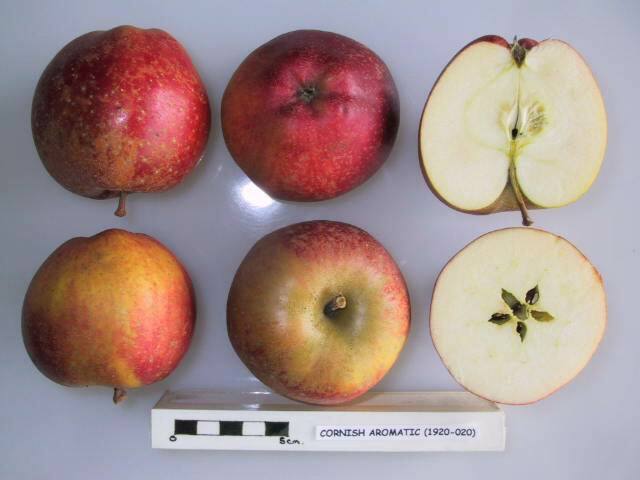 Cornish Aromatic is an elegant old-fashioned apple variety from Cornwall. The skin is rough and dry and and looks and feels like an expensive but worn old tapestry. The flesh is firm, not particularly juicy, and the flavour is quite rich with a hint of pineapple. 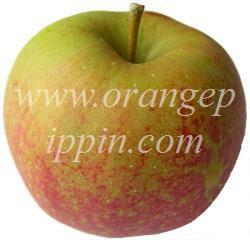 It is quite a good apple tree for the garden, being easy to grow and resistant to the main apple diseases. In a good summer (e.g. 2006) this is a very enjoyable apple. very late tree ,picking 2nd week in November at earliest. Keeps well into February ...if I havnt eaten it. Like this apple , its quite unusual . Matt skin , strawberry coloured flush . Flesh extremely hard. Purchased from Tasmanian Orchard 2007 Looking for a Michaelmas Pippin without success. This seemed to be the nearest to it. Have had three fantastic crops for a small tree. The last tree to pick in April. Still storing well into May. Superb flavour, much enjoyed. A Cornish friend, peggy Tigwell, tells me that this type was in her grandmother's garden, where it was called 'Sweet lark'. Couldn't be a prettier name, could there!